Afriqiyah Airways flight 771, an Airbus A330-202, crashed on approach to Tripoli International Airport, Libya. There were 11 crew members and 93 passengers on board. One passenger survived the accident. On May 11, 2010 at 19:45 UTC, the aircraft departed Johannesburg-O.R. Tambo International Airport (JNB), South Africa on an international passenger flight to Tripoli. The co-pilot was pilot flying. The en route part of the flight was uneventful. The captain contacted the Tripoli ACC controller at 05:29 local time (02:29 UTC) and received clearance direct to Tripoli for a TW locator approach to runway 09. Weather was reported as: wind calm, visibility 6 km, clear sky, temperature/dew point 19/17°C, QNH 1008. After receiving further descent clearances, the crew contacted the Tripoli Tower controller at 05:58. Tripoli Tower cleared the aircraft to continue the approach and to report runway in sight. At 06:00 the flight passed the TW locator beacon at an altitude of 1000 feet, 200 ft below the prescribed altitude. The captain then informed ATC that he would report when runway in sight. The approach was continued below the Minimum Descent Altitude of 620 feet but the crew still did not have the runway in sight. At an altitude of 280 feet the GPWS sounded ('too low terrain'). The captain then instructed the co-pilot to execute a go-around, after which he informed the Tower controller. The aircraft began to climb, reaching an altitude of 450 feet above ground level. The Airbus then nosed down, causing the captain to take priority over the flight controls by pushing on priority button and the aircraft was fully under the captain's control who applied a sharp nose down input. The captain did not verbally state that he was taking control. He applied a pitch-up and a pitch-down input on his stick until the airplane impacted the ground 1200 m from the threshold of runway 09 with high energy (-4400 ft/min) and high longitudinal velocity (260 kts). The aircraft broke up, leaving an 800 m long wreckage trail. The pilots' performance was likely impaired because of fatigue, but the extent of their impairment and the degree to which it contributed to the performance deficiencies that occurred during the flight cannot be conclusively determined. - The lack of common action plan during the approach and a final approach continued below the MDA, without ground visual reference acquired. - The lack of monitoring and controlling of the flight path. - Inappropriate systematic analysis of flight data and feedback mechanism within the AFRIQIYAH Airways. - Non adherence to the company operation manual, SOP and standard terminology. - Weather available to the crew did not reflect the actual weather situation in the final approach segment at Tripoli International Airport. - In adequacy of training received by the crew. - Occupancy of tower frequency by both air and ground movements control. All Flight Crews are required to comply with company operations manual in regard to reportable events despite of the Crew member position. Airbus has to review its training courses syllabus emphasising on go around, emergency procedures and taking into account low visibility and somatogravic illusion. Civil Aviation Authority of Libya should develop a system for the supervision and control of medical examiners, including action to be taken in the event that sufficient evidence exists to demonstrate that a medical examiner has not performed his or her duties in accordance with the prescribed procedures. Flight Crew must immediately after landing report to ATC occurrences such as go around, and to the Company safety division before next flight. Also ATC staff are encouraged to report such event in due time. ATC should report any abnormal occurrences associated with the operation of Aircrafts to the concerned entities within the Civil Aviation Authority. Entities conducting audits on AFRIQIYAH Airways (including company quality system, LYCAA, and IOSA) should pay more attention to areas related to safety, operation, and flight analysis during their audits. AFRIQIYAH Airways should make available and use of a clear crew rest programme for augmented crew in long haul flights. AFRIQIYAH Airways should make sure that somatogravic illusion phenomena is covered in pilot recurrent trainings. 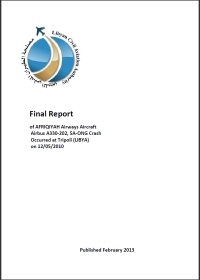 AFRIQIYAH airways should make a regular follow up and control on pilot performance emphasising on Crew CRM (make use of LOSA) and in particular to review the CRM training in order to minimize the gap between the CRM as prescribed in the manuals and how it is practiced during scheduled flights. ATC Tower should consider downgrading of the airport fire category whenever the fire brigades or part of are engaged with an airport emergency. National Safety Board should properly train the rescue team to indicate and label the injured and victims in the crash site. Flight Crews should strictly adhere to company SOPs. ICAO should review the requirement and the principles of the ELT. The National Meteorological Centre should upgrade weather services at Tripoli International Airport as well as meteorological warnings have to be issued in due time in case of significant weather change. Airlines have to comply with the current regulation related to flight analysis programme and to create an environment of safety awareness. Aircraft maintenance personnel must not perform any maintenance work if it is not covered by the manufacturer’s documents and subsequently consultation with the manufacture is recommended. Air traffic control personnel have to comply with the national and international standard in performing their duties as well as to stick with the standard phraseology used in the field. Air traffic control personnel have to take much care about runway selection taking in consideration wind speed, direction and runway facilities as main factor. Air Navigation Department within Civil Aviation Authority of Libya should distinguish the ground and the air as will as approach and area movements communication knowing that facilities are available. Airports Authority should upgrade Runway 09 in Tripoli International Airport to be equipped with precision approach facilities. Civil Aviation Authority of Libya and National Safety Board should make available and use of radio communications facilities between airports tower and fire fighting trucks. Distance from Johannesburg-O.R. Tambo International Airport to Tripoli International Airport as the crow flies is 6709 km (4193 miles).